It was a pleasant surprise when I woke up this morning to see 4 fresh inches of snow on the mountain. So instead of riding groomers and waiting for the next storm, my morning was filled with some fresh lines and great views. Even with the fresh snow, the conditions up there can be a bit variable when you leave the groomed runs. The wind was howling last night so the snow depth can change quite a bit from turn to turn. As long as the sun stays out though, you can easily spot the deep pockets of powder to turn in. When I left the resort, the sun was out and the views towards the Flat Tops were amazing. By the time I got to my computer, the clouds moved in and the first bands of the coming storm have reached Steamboat. The storm is coming from the Southwest so it’s pretty warm and the winds are strong. So strong that the gondola was running at half speed this morning and Storm Peak lift and Pony Express are both closed. While that may sound like a bad thing, if you can make it over to Sundown you will have a lot of great terrain to yourself. The runs below Sundown Lift Line to the left and right were pretty fun this morning if you went slow. The open areas look smooth because the wind has blown the snow from the trees out onto the run. But in reality, the snow has just filled in the moguls and the top of the bumps are just below the surface. So try and stay to the left side of the runs in this area since it will be less wind affected and the trees will add contrast and make it easier to see. After a few runs off Sundown, I ventured over to Sideburn and couldn’t believe how un-tracked it was. There were only a few lines going in to the top of the run and the snow was way more consistent than the other side of the mountain. The skiers right side of Closet and Sideburn are going to be some of the best tree runs today since they are both blocked from the southwesterly wind. As the day moves along, we should continue to see bands of clouds move over the mountain until around 3-4 pm when the real storm arrives. So if the lifts start to open back up there should be a lot of untouched snow in Pioneer Ridge and on the runs under Storm Peak. It’s possible that some of these bands of clouds will drop a few inches of snow up there, so if you are going up for the afternoon be prepared for the weather to change in an instant. Your best bet for the afternoon will probably be riding the Thunderhead lift and exploring the groomers and lower mountain tree runs. POWDER!!!!! 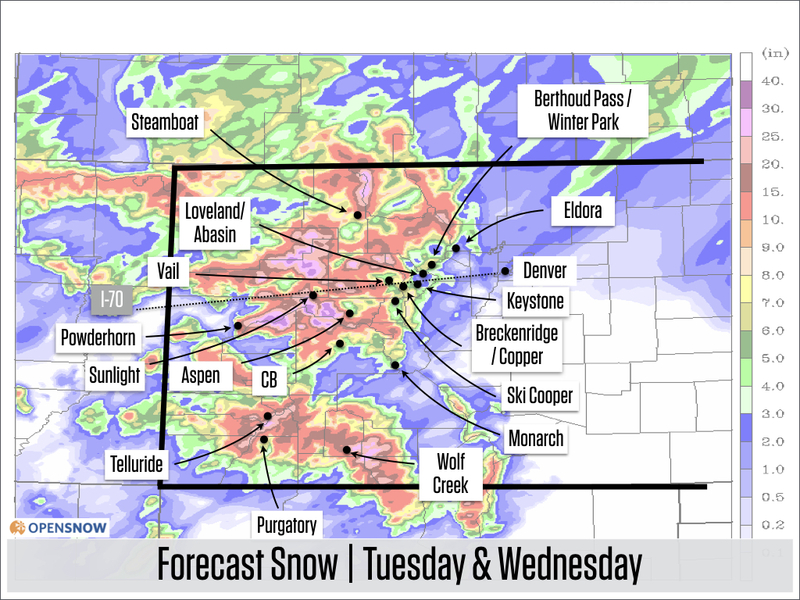 It looks like we should see 4-8″ of snow from this storm and even up to a foot if things work out right! So make sure you are up early tomorrow and get to the mountain to beat the crowds.